Researchers have used CRISPR to treat an adult mouse model of Duchenne muscular dystrophy. This marks the first time that CRISPR has successfully treated a genetic disease inside a fully developed living mammal with a strategy that has the potential to be translated to human therapy. 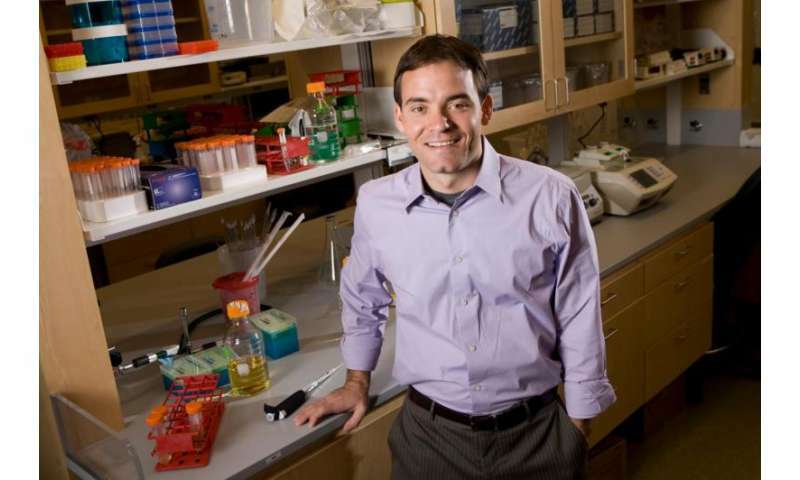 Researchers from Duke University had previously used CRISPR to correct genetic mutations in cultured cells from Duchenne patients, and other labs had corrected genes in single-cell embryos in a laboratory environment. But the latter approach is currently unethical to attempt in humans, and the former faces many obstacles in delivering treated cells back to muscle tissues. Another approach, which involves taking CRISPR directly to the affected tissues through gene therapy techniques, also faces challenges, particularly with delivery. In the new study, Duke University researchers overcame several of these obstacles by using a non-pathogenic carrier called adeno-associated virus, or AAV, to deliver the gene-editing system. The paper appears on Dec. 31, 2015 in Science. "Recent discussion about using CRISPR to correct genetic mutations in human embryos has rightfully generated considerable concern regarding the ethical implications of such an approach," said Gersbach, associate professor of biomedical engineering at Duke University. "But using CRISPR to correct genetic mutations in the affected tissues of sick patients is not under debate. These studies show a path where that's possible, but there's still a considerable amount of work to do." Duchenne muscular dystrophy is caused by problems with the body's ability to produce dystrophin, a long protein chain that binds the interior of a muscle fiber to its surrounding support structure. Dystrophin is coded by a gene containing 79 protein-coding regions, called exons. If any one exon gets a debilitating mutation, the chain does not get built. Without dystrophin providing support, muscle tends to shred and slowly deteriorate. Duchenne affects one in 5,000 newborn males. Most patients are wheelchair-bound by age 10 and don't live beyond their 20s or early 30s. The mutation is on the X chromosome so female children with two X chromosomes should have at least one functioning copy of the gene. Gersbach has been working on potential genetic treatments for Duchenne with various gene-altering systems since starting his lab at Duke in 2009. His lab recently began focusing on CRISPR/Cas9—a modified version of a bacterial defense system that targets and slices apart the DNA of familiar invading viruses. While Gersbach has had success in cultured patient cells by using a jolt of electricity to punch holes in their membranes to deliver the CRISPR system, this strategy was not practical in a patient's muscle tissues. "A major hurdle for gene editing is delivery. We know what genes need to be fixed for certain diseases, but getting the gene editing tools where they need to go is a huge challenge," said Chris Nelson, the fellow in Gersbach's laboratory who led the work. "The best way we have to do it right now is to take advantage of viruses, because they have spent billions of years evolving to figure out how to get their own viral genes into cells." Nelson and Gersbach began working on packaging gene editing tools into AAV—the most popular virus for delivering genes today. They were assisted through collaborations with AAV experts Aravind Asokan, associate professor at the University of North Carolina—Chapel Hill School of Medicine, and Dongsheng Duan at the University of Missouri School of Medicine. Duan also provided significant expertise from a long history of work on gene therapy for neuromuscular disorders. To use viruses as delivery vehicles for gene therapy, researchers take all the harmful and replicative genes out of the virus and put in the therapeutic genes they want to deliver. While early virus types didn't work well for various reasons, such as integrating into the genome and causing problems or triggering immune responses, AAV thus far has proven special. It's a virus that many people are exposed to anyway and is non-pathogenic, but still exceptionally effective at getting into cells. AAV is in use in many late-stage clinical trials in the United States, and has already been approved for use in one gene therapy drug in the European Union. There are also different versions of AAV that can preferentially go to different tissues, such as skeletal and cardiac muscle, so researchers can deliver them systemically. But there's always a catch, and for Gersbach it was a matter of size. "AAV is a really small virus and CRISPR is relatively large," said Gersbach. "It simply doesn't fit well, so we still had a packaging problem." The solution came from Feng Zhang, an investigator at the Broad Institute of the Massachusetts Institute of Technology and Harvard. Earlier this year, Zhang described a CRISPR system from a different bacterium than the one commonly used. In the natural bacterial immune system, CRISPR is the mug shot that helps identify the target DNA, and Cas9 is the blade that slices the strands. The large Cas9 protein typically used by researchers comes from the bacterial species Streptococcus pyogenes. After scouring the bacterial kingdom, Zhang discovered the much smaller Cas9 protein of Staphylococcus aureus. Small enough to fit comfortably inside of AAV. In the study, researchers worked with a mouse model that has a debilitating mutation on one of the exons of the dystrophin gene. They programmed the new CRISPR/Cas9 system to snip out the dysfunctional exon, leaving the body's natural repair system to stitch the remaining gene back together to create a shortened—but functional—version of the gene. Besides being much easier and more efficient than replacing the dysfunctional exon with a working copy, simply snipping out the weak link is a strategy that would be effective in a larger swath of the patient population. Gersbach and his team first delivered the therapy directly to a leg muscle in an adult mouse, resulting in the restoration of functional dystrophin and an increase in muscle strength. They then injected the CRISPR/AAV combination into a mouse's bloodstream to reach every muscle. The results showed some correction of muscles throughout the body, including in the heart—a major victory because heart failure is often the cause of death for Duchenne patients. "There is still a significant amount of work to do to translate this to a human therapy and demonstrate safety," said Gersbach. "But these results coming from our first experiments are very exciting. From here, we'll be optimizing the delivery system, evaluating the approach in more severe models of DMD, and assessing efficiency and safety in larger animals with the eventual goal of getting into clinical trials." Soon Bid Good Riddance for the Genetic Diseases! This is a clear benefit of the revolutionary CRISPR techniques. But the technique is on the whole a terrifying Pandora's box with a future far more likely to threaten us than benefit. Interesting! Cas-9 protein is derived from proteins from infective organisms, some deadly. However here this is used for good. Strange bedfellows in biology as well as politics. They programmed the new CRISPR/Cas9 system to snip out the dysfunctional exon, leaving the body's natural repair system to stitch the remaining gene back together to create a shortened—but functional—version of the gene. Besides being much easier and more efficient than replacing the dysfunctional exon with a working copy, simply snipping out the weak link is a strategy that would be effective in a larger swath of the patient population. Simply snipping out the weak link is going to have very limited utility. Eventually they'll have to figure out how to replace a dysfunctional or missing exon or gene.